We were hangin’ last week laughing about all the “romantic” things that turn out not – the constant “grass is always greener” kind of imagining about living this way or that, and the more seriously unfortunate romantic notions like eager young men going off to fight in a war for “an honorable cause” only to come home (if they’re lucky) with post-traumatic stress disorder and painfully disillusioned. Well, living off-grid has not so much life-death drama (well, can have…) but many off-grid-wannabe’s do over-romanticize the whole she-bang just out of plain in-experience. Hey – Jack here from the DaiaSolGaia community to talk about another of my building projects. I am DaiaSolGaia’s “jack of all trades” (yea, i know … sorry for the pun …). I want to tell ya about another of our “experiments” that has become pretty integral in our life out here off-grid and away. I’ll also warn you right off the bat that the water heater that we built is a “below the mason dixon line” water heater – that is – the kind of solar hot water booster I’m going to tell you about here is not suitable for areas with extended low temps with accompanying extended lack of sun. 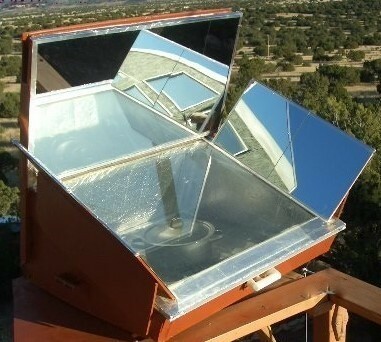 That said, there are reasonable options for solar hot water boosting depending on the configuration/orientation of your more northern (or higher altitude) house. The links for the pretty good “How To” books are just below.